Set sail with us on March 3, 2016, for a lovely cruise from Ft. Lauderdale to Cozumel and back! Two lazy days at sea to color to your heart's content, make new friends, eat delicious food, and just relax. Cozumel "features great diving, snorkeling and beaches, marine-life encounters, botanical gardens, trails, and shopping in the town of San Miguel." 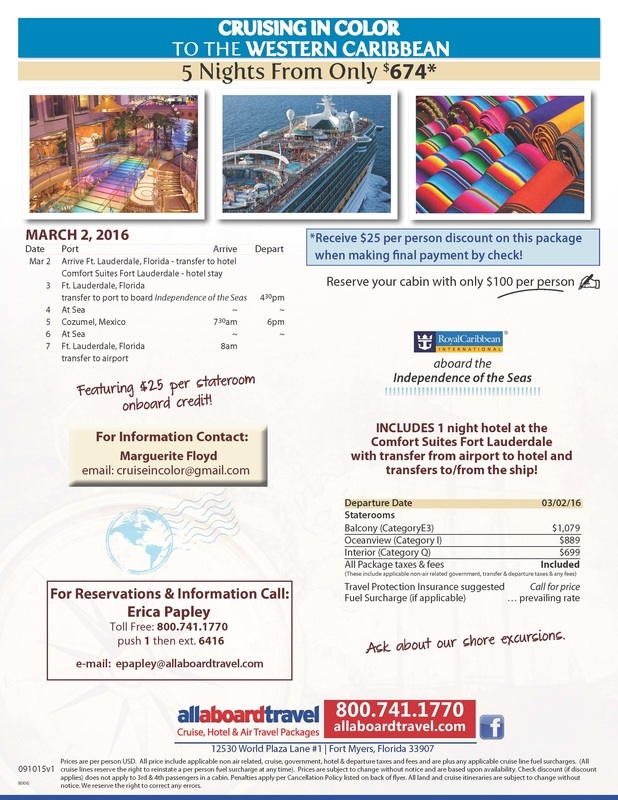 Below are details about the cruise package. Please note that these prices are per person, based on double occupancy. Your meals are included as well as the items listed below. You are responsible for your airfare, any excursion you want to take, souvenirs, and so on. If you need a room mate, we can work that out for you. Your package includes: cruise on Royal Caribbean Cruise Lines, taxes and fees for the cruise, hotel for the night before the cruise with taxes (3/02), transfers from airport to hotel and hotel to port, and on the return transfer from port to airport. Also includes $10 for colorist-related fees and activities. Tell her you're ready to Cruise in Color! You cannot get these prices or sign up for this cruise with any other agency or agent.